Our girls—Buttercup [a Buff Cochin], Scout, Hushpuppy [both Amerucaunas], and Frida [a Silver-laced Wyandotte]—live in a large, airy chicken run constructed from repurposed wood from an old deck and hardware cloth. There’s an 18”-deep cement curb that serves as the run’s predator-proof foundation. 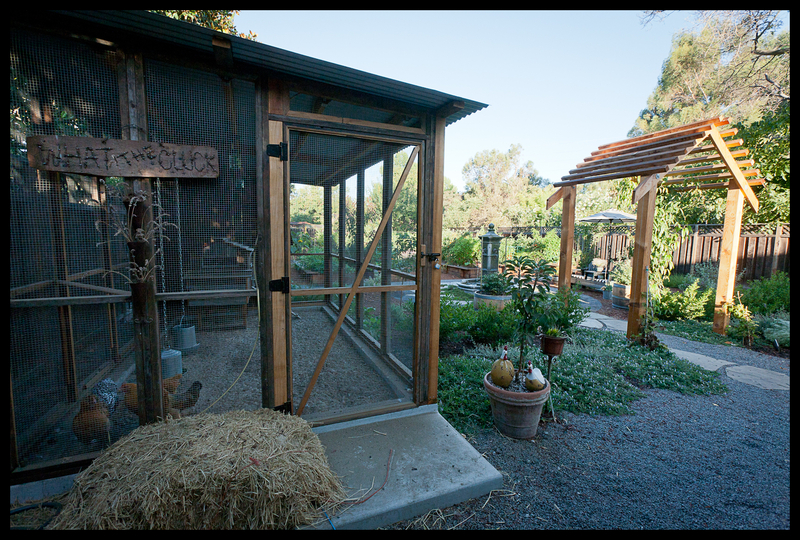 Inside is a cute rustic coop that overlooks a large vegetable garden, fruit orchard and fountain. At night, the run is lit by two antique canning jars—an homage to the owner’s near-obsessive canning efforts. The yard is also home to an industrious hive of bees that happily pollinate the many fruits and vegetables in the garden and occasionally provide honey. Nearly everything you’ll see on the tour of our coop stop is a result of a desire to know where our food comes from and how it was treated before it wound up on our table. By raising our own chickens, we can rest assured that the eggs we eat come from some very happy hens! Join us in the backyard for water infused with herbs, cucumbers and lemons from the garden and an opportunity to sample some of the owner’s spicy tomato jam.